Investors can’t take their eyes off the Dow. The Dow Jones Industrial Average has jumped more than 7% since Election Day. Last month, it set a new all-time high. But that hasn’t been enough for many folks. They’re waiting for the Dow to top 20,000. From a technical perspective, “Dow 20,000” wouldn’t mean much. Right now, it sits at 19,876—within 1% of the mark. Still, Dow 20,000 could have a huge psychological impact. After all, it’s a big, round number. Most people would be excited to see the Dow reach this milestone. If it does happen, many investors who are sitting on the sidelines could jump back into stocks. But that doesn’t mean you should obsess over Dow 20,000. Gross is one of the world’s most respected investors. He founded PIMCO, one of the world’s biggest money managers. Today, he manages a giant bond fund at Janus Capital Group. [T]his is my only forecast for the 10-year in 2017. If 2.60% is broken on the upside—if yields move higher than 2.60%—a secular bear bond market has begun. Watch the 2.6% level. Much more important than Dow 20,000. Much more important than $60-a-barrel oil. Much more important that the Dollar/Euro parity at 1.00. It is the key to interest rate levels and perhaps stock price levels in 2017. Notice Gross said “secular” bear market. That means he thinks bond prices could fall for years, possibly decades. That’s only 20 basis points (0.2%) below 2.6%. In other words, Gross thinks the bull market in bonds could end any day now. Most investors aren’t ready for this. You see, bonds have been in an uptrend since the 1980s. This historic bull market has survived three recessions, the dot-com crash, and the 2008–2009 financial crisis. Many investors have only seen bond prices go up…that is, until recently. Corporate and municipal bond yields have also skyrocketed over the last few months. For one, the Federal Reserve just lifted its key interest rate for only the second time since 2006. The Fed also plans to raise rates three more times in 2017. This has had huge implications for the bond market. You see, the Fed’s key rate sets the tone for other rates. 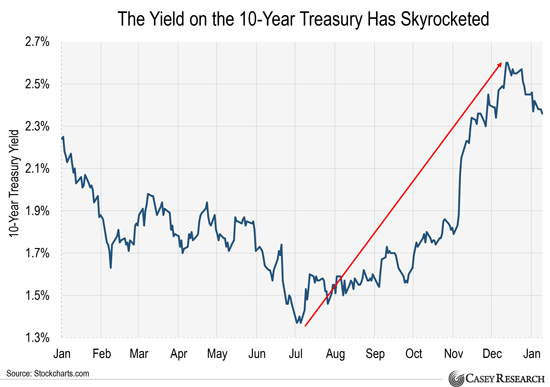 When it rises, bond yields rise, too. Most investors also expect economic growth and inflation to pick up under Trump, which would both be bad for bonds. In this free presentation, former banker and master stock picker Chris Mayer reveals his breakthrough strategy for identifying tomorrow's biggest stock market winners, today. Based on research conducted by the former bureau chief of The Wall Street Journal's Washington office, an editor at Barron's, the head of research at a Fortune 500 company, and a partner at Scudder, Stevens & Clark. Historically tested against more than 82 years. Now refined to recognize today's stocks with million-dollar potential in their early stages… before they start to rise. Click here to watch it before it expires. Gundlach is another world-class investor. He manages more than $100 billion at DoubleLine Capital. Many folks consider him the new “Bond King,” a nickname Gross held for decades. It's “almost for sure” that the 10-year yield is going to take out 3% in 2017, Gundlach said. “It's bye-bye bull market, rest in peace.” Yields rise as bond prices fall. “That will define the end of the bond bull market from a classic chart perspective, not 2.60,” he added. That's because there would no longer be declining valleys in yields, with the trough of 1.39% established in 2012. The yield on the U.S. 10-year would have to rise another 60 basis points (0.6%) to hit 3.0%. A year ago, that might have seemed impossible. Not anymore. Remember, the yield has already surged 100 basis points (1.0%) in just six months. Gundlach doesn’t think the 10-year yield will stop at 3.0% either. He thinks it could reach 6% by 2020. That would be the highest level since 2000. But you have to keep in mind, the bond market is nearly twice as big as the stock market. It’s also where companies borrow money. If rates keep rising, it’s going to become more expensive for companies to borrow money. And that’s the last thing Corporate America can afford right now. Since 2010, U.S. corporations have borrowed $9.3 trillion in the bond market. That’s 57% more than they borrowed in the seven years leading up to the 2008–2009 financial crisis. The debt-to-EBITDA ratio for non-financial companies in the S&P 500 now sits at 1.88, according to research firm FactSet. That's up from 1.0 at the start of 2015. It's also the highest level in over a decade. If borrowing costs keep rising, companies with a lot of debt could struggle to pay their bills. We could even see a huge spike in corporate defaults. You should also take a good, hard look at your stock portfolio. You should also avoid companies that need cheap credit to make money. If rates keep rising, these companies could run into serious problems. Investors haven’t been this complacent in years. Today’s chart shows the performance of the Volatility Index (the “VIX”) since 2010. The VIX tells us how volatile traders expect the near future to be. 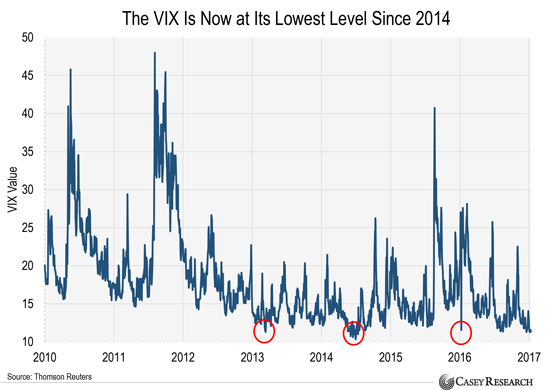 When the VIX is high, it means traders expect a lot of volatility. When it’s low, it means they think the market will stay calm. You can see that the VIX is now at its lowest level in years. In fact, it’s only been this low three other times since 2010. Now, we realize Trump could go down as the most “pro-business” U.S. president since Ronald Reagan. But it’s going to take time for him to implement his policies. Many investors seem to have forgotten this. You also have to remember the U.S. stock market has big problems that the president could never fix. For starters, corporate debt is through the roof and U.S. stocks are incredibly expensive. In short, investors shouldn’t be complacent right now. They should be nervous. That's why we urge you to own physical gold. It's the best way to protect yourself from a stock market crash or any other financial crisis. If you have a question or comment, please send it to [email protected]esearch.com. We read every email that comes in, and we'll publish comments, questions, and answers that we think other readers will find useful.